Fishing enthusiasts can be found all over the world, from deep sea fishermen to fly fishers to laid back lake fishermen. Fishing can provide a relaxing, recreational experience or it can be part of a vast commercial operation. Anglers try their luck in all water types, including lakes, streams, rivers, and oceans. Whatever your preferred method of fishing might be, comfort and practicality is a big part of your fishing attire. Hook and Tackle has made a name for itself as America’s premier outdoor, nautical, and sport fishing apparel company by focusing on the finer points of the sport of fishing and meeting those needs. 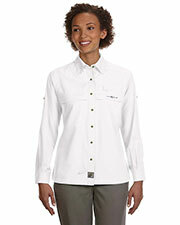 Gotapparel.com supplies several affordable Hook and Tackle shirts that are perfect for any kind of sport fisherman. Hook and Tackle focuses on two lines of sport fishing apparel, technical fishing gear for use while you are actively fishing and the sportsman’s gear collection so that you can have a distinctly nautical look for when you are planning your next fishing adventure. Affordable Hook and Tackle fishing shirts are designed to be light-weight, quick drying, wrinkle resistant, stain repellant, and offer maximized solar protection. Whether you are an amateur or a professional, you are sure to appreciate their unique and distinctive combination of features. These special qualities, also, appeal to other outdoors types and Hook and Tackle shirts are ideal for hiking, camping, and other outdoor adventuring activities. Be prepared for anything by including t-shirts, hats, and backpacks to your active wear collection.